Do you know about the latest in Campbell Scientific software? 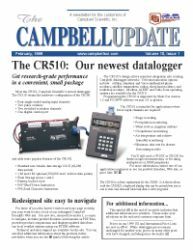 The CR510’s design allows seamless integration into existing Campbell datalogger networks. Telecommunication options include: cellular, standard, and voice-synthesized phone modems; satellite transmitters; radios; short-haul modems; and multidrop modems. Modbus, ALERT and Table Data operating systems are available for the CR510. Programming the CR510 is supported by Short Cut version 1.2 and PC208W software version 3.0 or greater. You’ll still need a CR10X or CR23X for thermocouple measurements, or for using multiplexers or SDM peripherals. For more information contact one of our applications engineers or see our product literature, Web site, or price lists.